Please make sure that you have already selected the country that is valid for you before registering. This corresponds mostly to the legal seat of your company. Please enter the destination network, which you want to reach through your VPN connection, for example, IP address of the network: 192.168.1.0 and Netmask: 255.255.255.0. (Phoenix Contact CS and the Client hereinafter “Party” or collectively “Parties”). the Client for legally valid signing after his registration at the latest. and signing the full-blown, more comprehensive License Agreement mentioned above. a software VPN client on the workstation side. on the side of the machine or system. 3. A web-based Portal application serving as the user interface. right to use the Cloud for the connection of service workstations and machines. be activated either permanently or only when needed. configurations is not further restricted by firewall rules. and machines of the Client but only the Internet connection of the Cloud. and then made available via the Portal for the Client to download. and Saxony as well as on December 24 and 31 of every calendar year). record log data on connection states and keep them for max. 18 months. (2) ANY FURTHER CLAIMS OF THE CLIENT SHALL BE EXCLUDED. DEVICES OR SOFTWARE VPN CLIENTS. FROM THE UNAVAILABILITY OR MALFUNCTION OR INCORRECT CONFIGURATION OF THE CLOUD. realization to the same level of confidentiality. three years after the expiry of this Agreement. data pursuant to the Federal Data Protection Act (Bundesdatenschutzgesetz). shall thereby be committed by Phoenix Contact CS to comply with the data protection laws. shall no longer apply upon its termination. the approval of the other Party. (3) Place of performance shall be the registered office of Phoenix Contact CS. claims at any other competent court of jurisdiction. provision. The same shall apply to any loopholes. (Phoenix Contact CS und der Mandant nachfolgend „Partei” oder gemeinsam „Parteien”). Registrierung zur rechtsgültigen Unterzeichnung übermittelt wird. Erprobung der Cloud im Rahmen einer kostenlos angebotenen Testphase erleichtern. dem Mandanten dann bereits vor Prüfung und Abschluss des umfangreicheren o.g. Online Evaluierungsbedingungen sind unter de.cloud.mguard.com/eval-eula einsehbar. Gerätes oder eines Software VPN Clients auf Seiten des Arbeitsplatzes. Gerätes auf Seiten der Maschine oder Anlage. 3. Eine Web-basierte Portal-Applikation als Anwenderschnittstelle. zu nutzen. Die dafür einzurichtenden VPN-Verbindungen zum Service-Gateway bzw. anschließend über das Portal für den Mandanten zum Download bereitgestellt. Kalenderjahres) unentgeltlich in Anspruch nehmen. (2) Sämtliche weitergehende Ansprüche des Mandanten sind ausgeschlossen. verfügbare Telekommunikationsdienste Dritter (Internet Provider) angewiesen. erlangen, im selben Umfang zur Geheimhaltung zu verpflichten. Dauer von weiteren drei Jahren bestehen. dabei durch Phoenix Contact CS auf die Einhaltung der Datenschutzgesetze verpflichtet. Rechte entfallen mit dessen Beendigung. Partei an einen Dritten übertragen werden. (3) Erfüllungsort ist der Sitz von Phoenix Contact CS. werden insoweit und wegen vorgenannter Fristüberschreitungen ausgeschlossen. Ansprüche an jedem anderen zulässigen Gerichtsstand geltend zu machen. You will receive a notification to the e-mail address given at registration, as soon as your account has been activated for the mGuard Secure Cloud. The mGuard Secure Cloud service team will usually get back to you within 1 business day. Meanwhile, please restrain from duplicate registrations. If in doubt and without response for 2+ business days, please use the contact form of the mGuard Secure Cloud for status inquiries. ** Entering security codes (Captcha) is used to determine whether or not the user is human. You can reset the password for your account by providing some information. Please fill out all mandatory information for authentication reasons and request a new password. Please enter your two-factor authentication PIN. Phoenix's mGuard Secure Cloud offers operators and machine builders a highly secure, web-based method for instant remote services to any machine and production plant within a client's network. The mGuard Secure Cloud is a professionally hosted, turnkey remote-services ecosystem for both the machine builder and the plant operator. Using a standard web browser, service personnel can connect to the Secure Cloud website and, after successfully authenticating, access all relevant client information: locations, operators, service targets (machines), users, as well as their access rights. A quick overview is also made available of all machines currently online and ready for instant remote service. Implementing and operating an industry-standard remote services solution can be a complex task. Our cloud-based service remedies this situation, with a turnkey system for industrial remote services for utility operators, machine builders and plant technicians. Setup takes place in a few easy steps with hard- and software configuration provided. The mGuard VPN technology uses the IPsec security protocol with strong encryption. This guarantees the confidentiality, authenticity and integrity of all information and data transmitted between the service staff and the machines. 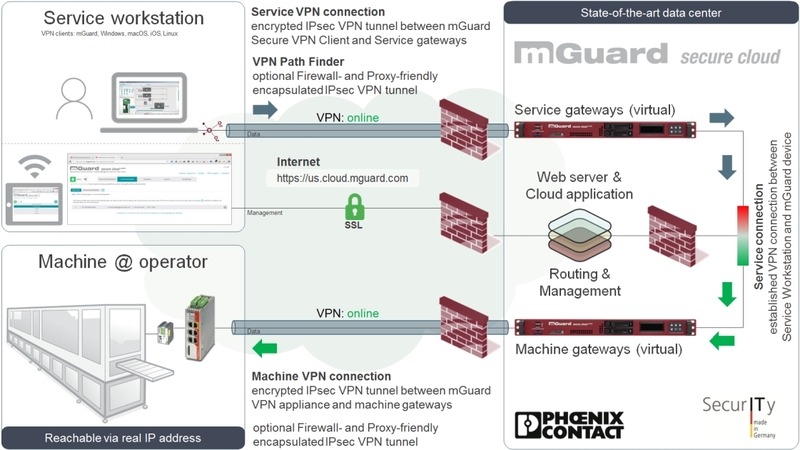 The mGuard Secure Cloud forms a powerful and scalable VPN infrastructure in the cloud, securely interconnecting service staff with machines and plants via the Internet. Operated in a state-of-the-art data center with 24x7x365 monitoring, this ensures maximum reliability and availability to support your machines, facilities and customers. Of course, your service targets (machines) and service technicians can access the mGuard Secure Cloud services worldwide. For service workstations, the mGuard Secure Cloud is also available for use with certified VPN software clients: the mGuard Secure VPN Client and the Shrew Soft VPN Client. The mGuard Secure VPN Client is a major component of the mGuard Ecosystem and ideal for road warriors, service staff and teleworker in mobile and stationary use cases. But also any mGuard VPN devices can be used: from USB-powered portable mGuards, devices for the desktop together with PCI-compliant versions. For the secure connection of machines to the mGuard Secure Cloud any mGuard VPN devices can be used. The comprehensive mGuard portfolio allows tremendous flexibility in application scenarios while maintaining high protection. The range varies from industrial-hardened versions with wired and wireless interfaces as well as hazardous location approvals, mGuards for 19" racks together with PCI-compliant and virtualized versions. Password is not long enough! Maximum number of failed logins reached, account temporarily disabled. Please select an item from the list! Your authentication was successful. We´ll send you an e-mail within a few minutes. Please check your spam folder when missing the e-mail. A connection error occurred. If this error remains, please contact the mGuard Secure Cloud support. Sorry for any inconvenience.